On the Project Information tab enter the name for the project. Make sure that the project name does not include white space, this restriction will eventually be fixed. Note that this is also the tenant name you will need later. 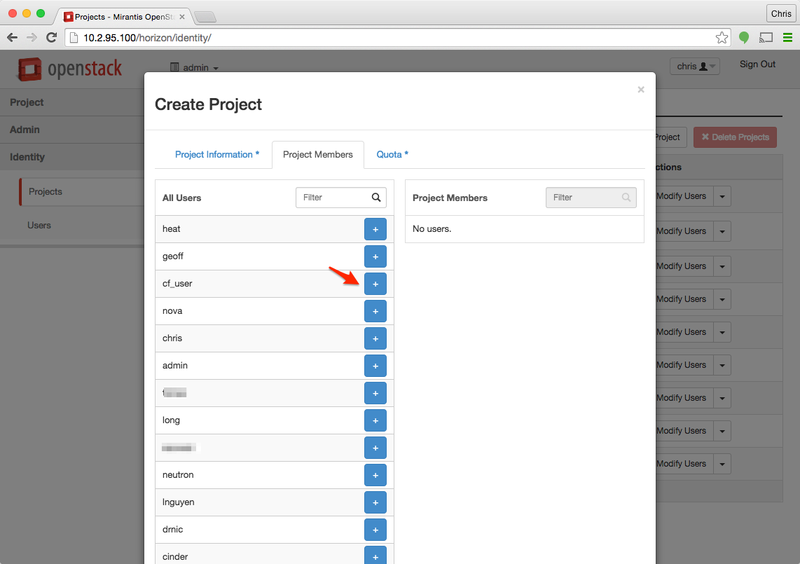 On the Project Members tab, select the user we created back in Step 1 by clicking on the blue "+" icon. Once the user is selected, be sure that the permissions for the user are _member_, higher permissions are not required and cause errors. Click Create Project when you are done adding users. 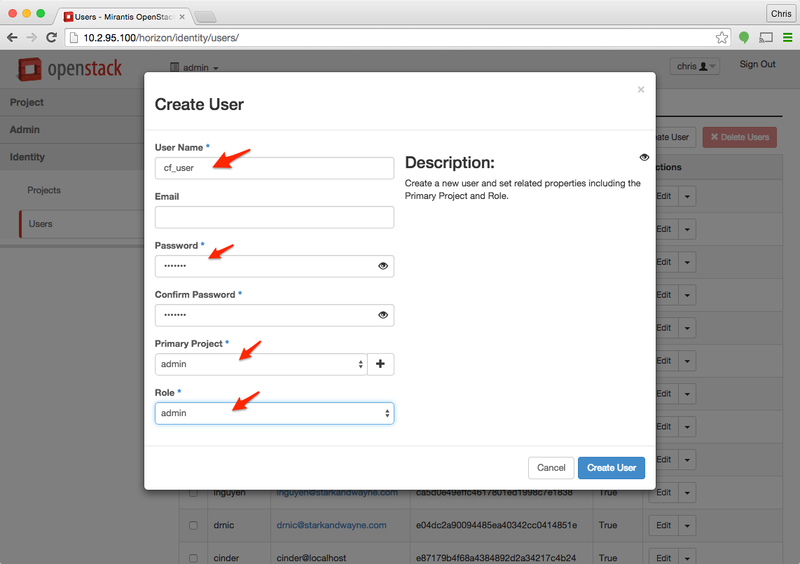 Now logout and login as the user cf-user (or whatever user you created in Step 1). 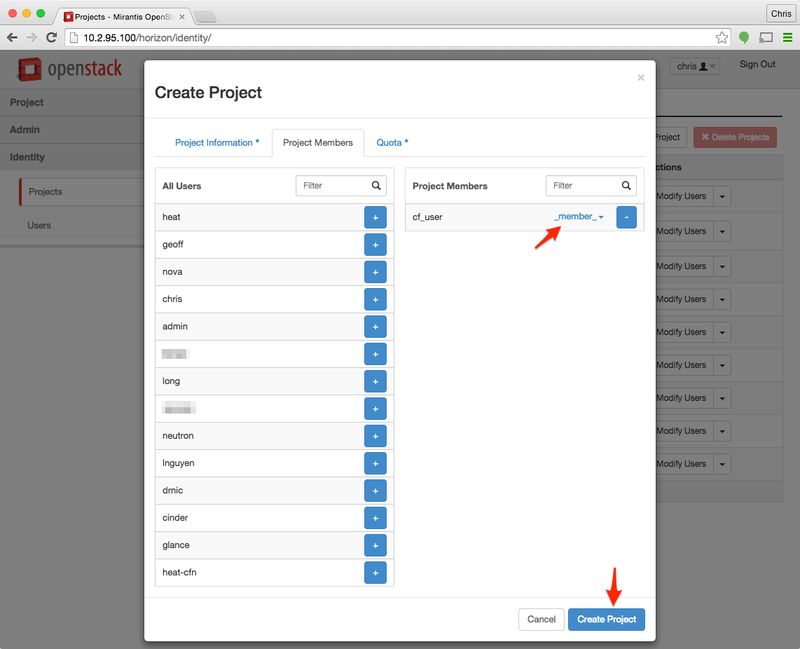 Select cf-terraform as the project and navigate to Identity > Projects. Identify the row which corresponds to the project we created in Step 2. The tenant id is located in the Project ID column for the identified project. This one is fairly simple, we have decided that all internal ip addresses should be in the range 192.168.x.x so network will be "192.168"
Logged in as cf-user and using the cf-terraform (the name we used in Step 2) project navigate to Project > Compute > Access & Security, and select the API Access tab. 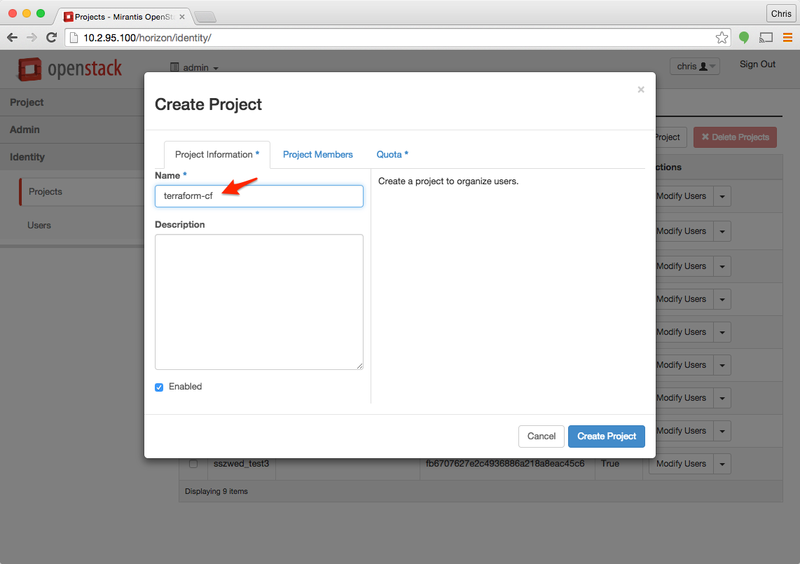 The auth_url is listed under the Identity Service Endpoint value. Logged in as cf-user and using the admin project (note: NOT cf-terraform project) navigate to Project > Network > Networks. 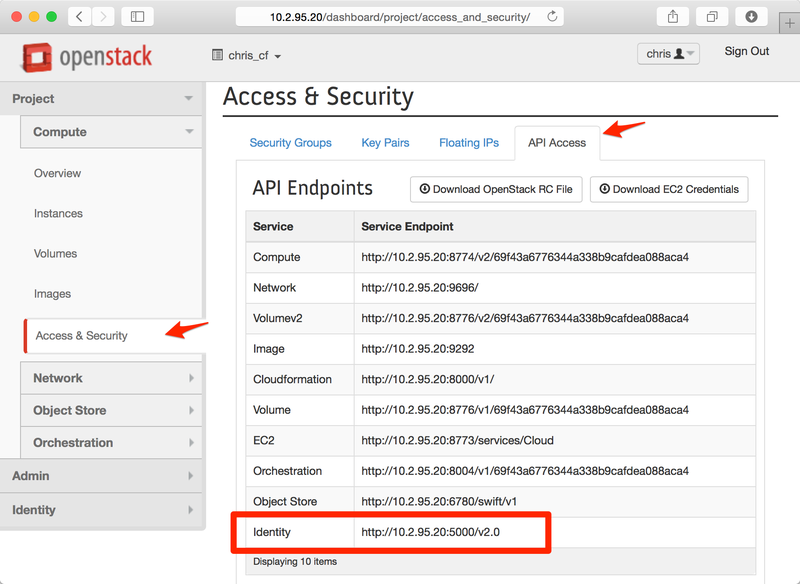 Your OpenStack administrator can identify the external network, the floating_ip_pool is listed under the Name column for the identified row. 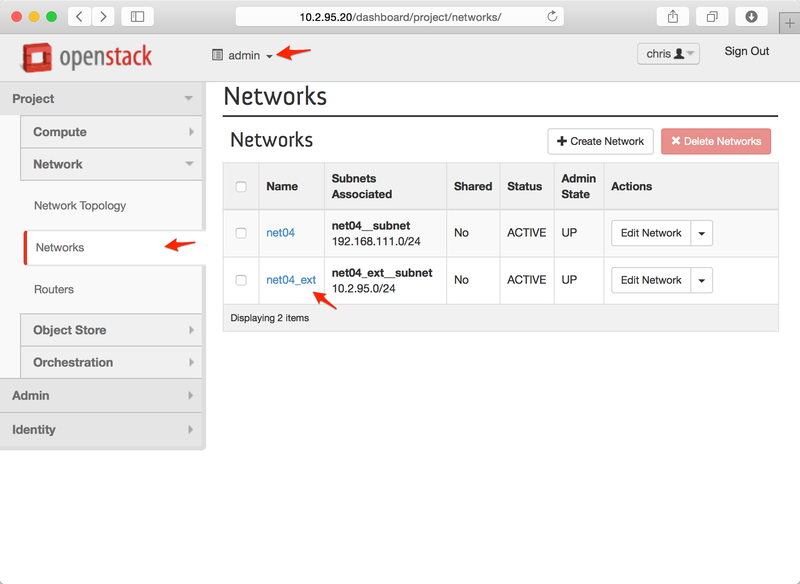 Logged in as cf-user and using the cf-terraform project navigate to Network > Networks, and select the floating ip pool from Step 6. 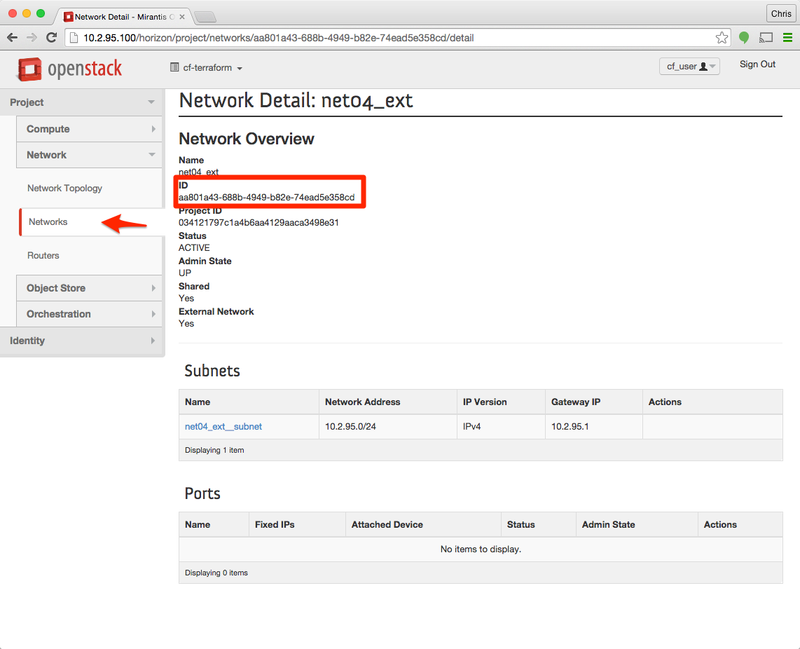 The network_external_id is listed under the section "ID". Since Windows does not have this functionality prebuilt, please consult whatever tool you are using to SSH to server.